NORTH CHARLESTON, S.C. — Shifting attention from his troubled White House, President Donald Trump hit the road Friday for a campaign-style rally, resurrecting the buoyant jobs promises that powered his election victory and pledging to "unleash the power of the American spirit." "We love our workers and we are going to protect our workers," Trump declared at a Boeing plant where the company showed off its new 787-10 Dreamliner aircraft. "We are going to fight for jobs. We are going to fight for our families," he said in a reprise of the "America First" message from his campaign. More of the same is expected Saturday when he holds a big rally in central Florida, a change of scenery that marks an effort to galvanize a month-old White House that has been buffeted by crisis and paralyzed by dysfunction. The new president toured a 787-10 still under construction and, before leaving, sat in the pilot's seat of a completed airplane painted in contrasting shades of blue that formed the backdrop for his remarks. Some 5,000 employees and others inside a hangar greeted him with chants of "USA, USA." The president, who owns an airplane but now travels exclusively on government aircraft, praised the Boeing jetliner as "an amazing piece of art." He noted that it's made of carbon fiber, seats 330 passengers, is 18 feet longer than the previous model and can fly for half a day before landing. "The name says it all. Dreamliner, great name," Trump said. "Our country is all about making dreams come true." "As your president I'm going to do everything I can to unleash the power of the American spirit and to put our great people back to work," he said. "This is our mantra: Buy American and hire American." Trump's appearance in South Carolina followed a marathon news conference Thursday at which he forcefully defended his performance in the opening weeks of his presidency. He brushed aside the turmoil, infighting among senior staff and setbacks in the courts and in Congress, saying his administration was running like a "fine-tuned machine." He also denounced the "criminal" leaks that took down his top national security adviser and revived questions about his own ties to Russia. Trump is still trying to stabilize his national security team. On Monday, he demanded the resignation of national security adviser Michael Flynn following revelations that Flynn had misled Vice President Mike Pence about Flynn's contacts with Russia. Trump's first choice to replace Flynn — Vice Admiral Robert Harward — turned down the offer. FBI Director Jim Comey left a meeting with senators on the intelligence committee Friday afternoon. Neither Comey nor the senators would discuss the subject of the meeting, but it followed reports that the FBI had interviewed Flynn about his contacts in late December with Russian officials. Trump tweeted Friday that "General Keith Kellogg, who I have known for a long time, is very much in play for NSA — as are three others." Kellogg, who is serving as the acting national security adviser, traveled to South Carolina with Trump aboard Air Force One. Also along on the trip were Trump's daughter Ivanka; her husband Jared Kushner, a senior adviser to Trump; White House chief of staff Reince Priebus and strategist Steve Bannon. Ivanka Trump waved and blew kisses to the crowd as she exited the completed 787-10 Dreamliner before her father did. The White House said Trump might interview national security candidates at his Palm Beach, Florida, estate, where he is spending the holiday weekend. In South Carolina, Trump said the jobs issue "is one of the primary reasons I'm standing here today as your president." He pledged to make it easier for companies to make products in America and harder for them to leave. "America is going to start winning again, winning like never before," Trump said, returning to a staple promise from last year's campaign speeches. 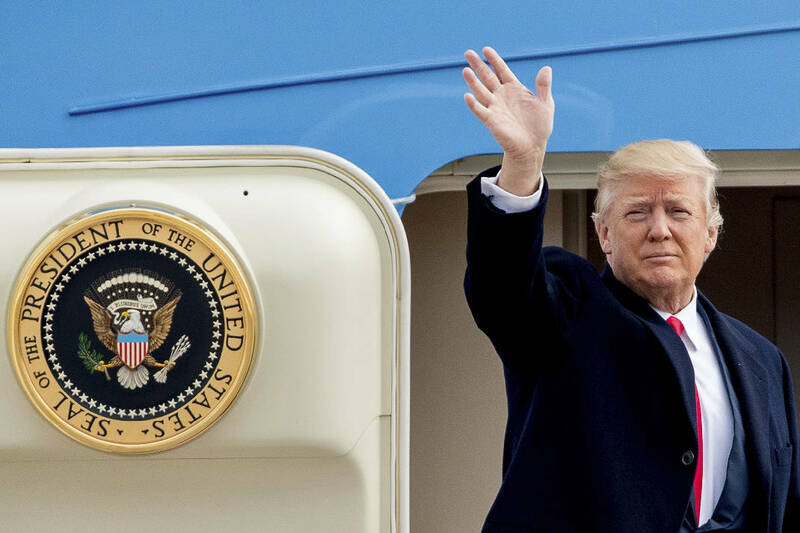 In his remarks, Trump also mentioned that he's been in talks with Boeing executives to reduce the cost to the government of building a future Air Force One presidential aircraft. Last March, the Government Accountability Office, the government's auditing arm, estimated total program costs at more than $3.2 billion, mostly for research and development through the 2020 budget year. Trump denounced the costs as "out of control." Asked by reporters for an update after Friday's speech, Trump said: "Price is too high. But we're negotiating." Trump has scheduled a campaign-style rally Saturday in Florida, his first as president. The event at an airport hangar in Melbourne will be 1,354 days before the 2020 election. Big rallies were the hallmark of Trump's presidential campaign. He continued to do them, although with smaller crowds, throughout the early part of his transition, during what he called a "thank you" tour. The Florida rally comes as he makes his third weekend trip this month to what he calls his "Winter White House," his Mar-a-Lago resort. The White House has not responded to questions about why Trump is putting on this event or who is paying for it.